As you are reading this, we suppose that you are interested in being a guest author. So it's the right time to have an overview of this website, through the Geek Upd8 Timeline. You can send us your article related to these weblogs. Geek Upd8 is here because of the uniqueness, that we have since the starting. Having said that, the first conditions is the uniqueness of the articles that you are going to submit us. Duplicate articles that are already published on any website won't be accepted. Please note that, in case you would be proving us such articles your future submissions will not be considered. The minimum length of the articles should be 600 words. The topics that are already covered will not be accepted. We accept articles only in English language. Authors will be granted an external link to their homepage. Authors are required to submit their image that can be added to their article in the author related information section. The Author will be responsible for the content of his/her article. Geek Upd8 website cannot be held responsible for the content of the article. In case, you meet with all the above said guidelines, you are welcome to submit your article. Please note that the final decision about the publishing of the articles will be of the website editor. In case any changes are required in the article, they will be discussed with the author before publishing the article. Even though every care is taken by the editor before publishing of the article, the responsibility for the content of the article will be of the author of that particular article. How to Submit the Article ? We are sure that by now you have made up your mind to write for G8 Network Blogs. Your articles will be reviewed by our editorial staff to match quality guidelines. 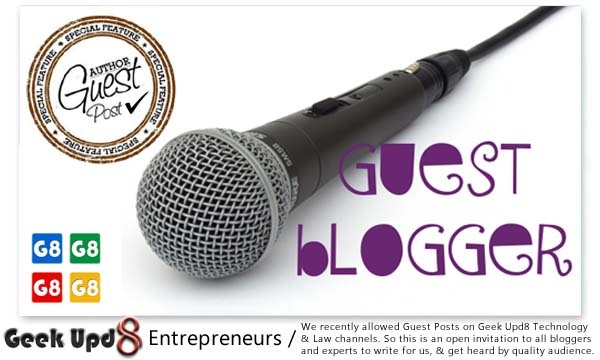 Kindly forward your articles to us at guest.author@geekupd8.com. Once your article is approved, it will be published within no time. Please make sure to share your article with your friends and circles on and off the web.